Wighill Park Guns | Products | Hawke Airmax 3-9×40 AO AMX Scope. 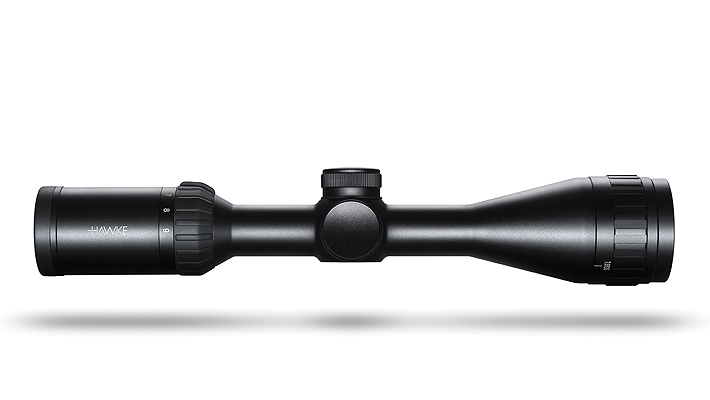 Hawke Airmax 3-9×40 AO AMX Scope. With a 16 layer fully multi-coated optics for exceptional clarity. Wide view optical system ideal for airguns. Glass etched reticle to withstand high recoil. Integrated adjustable objective for parallax adjustment. With a 1″ mono-tube chassis for superior strength. With 1/4″ MOA low profile no-snag fingertip turrets. Fast focus eyeball and high torque zoom ring. Threaded objective/ocular for optical accessories. The AMX Reticle and the AMX IR glass etched reticles are based on the spacing of a 10x Mil Dot. The AMX offers multiple aim points which is useful when shooting an airgun with loopy trajectories. Half Mil Dot spacing on the lower post provides increased aim points for long shots. The horizontal bars are calculated at 0.5, 1.5, 2.5, 3.5 and 4.5 mil spacing. Field of view: 12.4 – 4.5 m @100m / 37.2 – 13.6 ft @100yds. Eye relief: 89mm / 3.5″. Air Arms S400 & S410 Silencer. Air Arms S410 Pre-Charged Rifle With a Beech Stock. Air Arms TX200 MK3 with a Walnut Stock.